First up in PART 1 of this blog is Rebecca Keil, creator of Rocky & Ruby Blog, The Mother Yarns and all round hilarious and awesome human. A year ago she and Jared were married in Taranaki. Rocky was 3 and Ruby 15 months old. Later in the week we will also speak with Kensie & Jane about their weddings with little ones in tow. There is so much good advice here, so put the kiddies to bed and have a read with a wine. Rebecca, Jared, Rocky & Ruby. Photos by Bianca Brons. 1. Was it always a given that your kids would be there and involved? Yes! Well, NO. So we got engaged at my 21st and obviously had no children and weren’t panning them for a while but roll on six months and I was knocked up and Jared was stoked we had to push the wedding out ha. I always wanted a quick turn around from engagement to wedding and Jared wanted longer, my mum jokes he went to great lengths to get his own way! But once we had Rocky we knew both our children would be at the wedding, we had always planned on just having two kids so it was a no brainer to bang out another kid and then get married which we did. 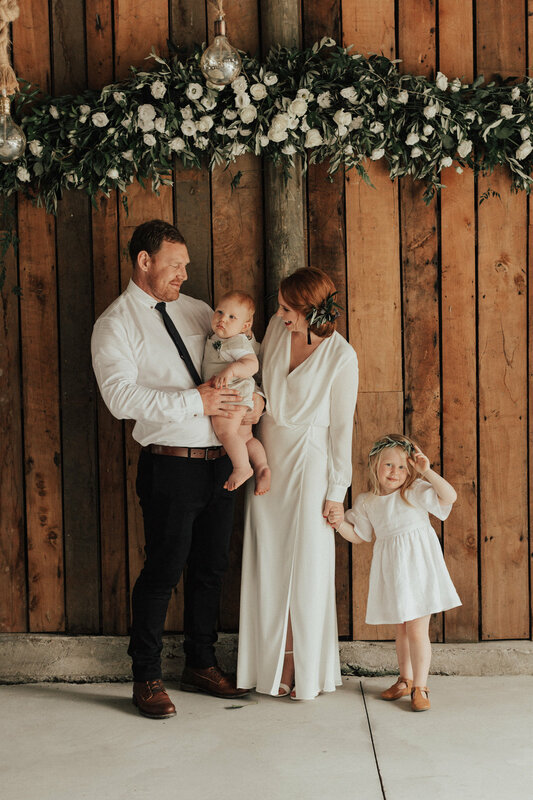 We are a husband and wife team with two children Rocky (4) and Ruby (2) we are from Taranaki and are somewhat high school sweethearts who live in Christchurch, where Jared is a hot cop and I run The Mother Yarns which is a hub of things for all the mums! We got engaged on my 21st at Rhythm and Vines in Gisborne (so romantic). No, it was super romantic, and then were married last year when we were 25. Well Ruby was 15 months old and was meant to walk down the aisle but she didn’t, she walked the next day which if you knew Rubes you would know that’s her style to a tee. We had this cute trolley with a cool balloon and all she had to do was push it, but no, she got carried down. Rocky stayed with Jared the night before and my mum had Ruby. They are in our getting ready photos and video which was really important to me, we have pictures of Jared getting Rocky ready and me getting Ruby ready. We didn’t expect much from them they were so young and I’m very relaxed so they just did want they liked, Rocky decided he would be sitting with us at the head table which was super cute so we had to get him a chair and set him a place. They say don’t work with kids or animals and I say remember that on your wedding day. Like I said don’t expect too much from them (like walking down the aisle at 15 months old, they won’t do it haha). Kids will be kids go with the flow it’ll all work out! - Delegate, this is your wedding day! Yes they are your kids but not today, today they are not your problem. - Put them in your time line, make sure they nap and eat and all that. 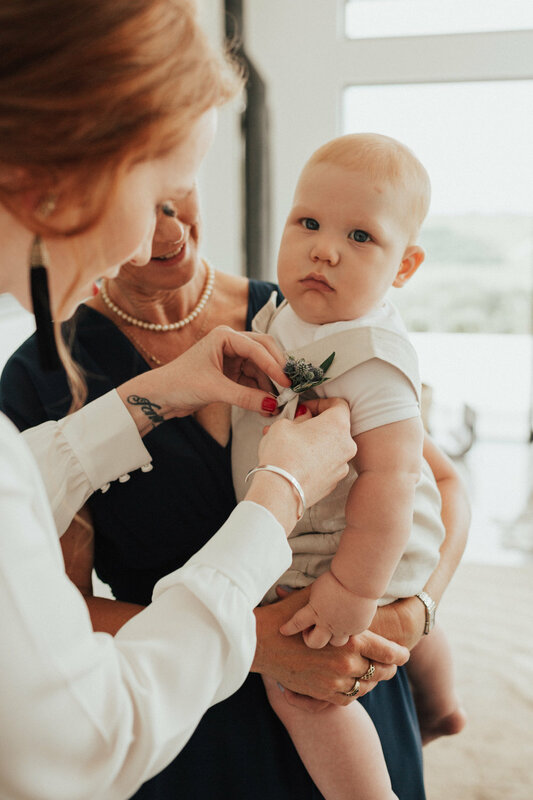 No we had a kid free wedding bar our immediate family and even then they were older kids, but then in saying that I am a mother and I know that babies need their mums so we kind of had a babe’s in arms policy. I think we ended up with a five month old just at the ceremony and a 5 day old there the whole time because my best friend and bridesmaid gave birth on the Tuesday before our wedding! The flip side is as a mum I wouldn’t want to take my kids to a wedding ever so I think it’s fine to ask for kids to not come but be considerate of tiny babies! Rebecca & Rocky, his very own 'first look'. Photos by Bianca Brons. Baby sitter – Get a baby sitter and just let kids be kids if you choose to have them there and involved!